It has been cold and gloomy in Hong Kong last week. Sadly, the outlook of our city’s rule of law and political rights of our people have also been as cold and gloomy. In the two decades since the handover, Hong Kong people have been fighting for democracy, in the form of universal suffrage, to choose our legislators and chief executive. It was only what we were promised under the Basic Law and this so-called One Country Two Systems. Instead, we have witnessed the central government’s gradual tightening of its grip on the high degree of autonomy under the Basic Law. These days, democratically elected legislators not only can be disqualified while in office, they can also be simply barred from running. Six months ago, four legislators from the democratic camp, who were then elected less than a year earlier in 2016, were disqualified and removed from office, after the Beijing regime issued a re-interpretation of Article 104 of the Basic Law, on the the provisions on oath-taking. The votes cast by hundreds of thousands of our citizens were in effect nullified and disqualified at the same time. And that wasn’t enough. 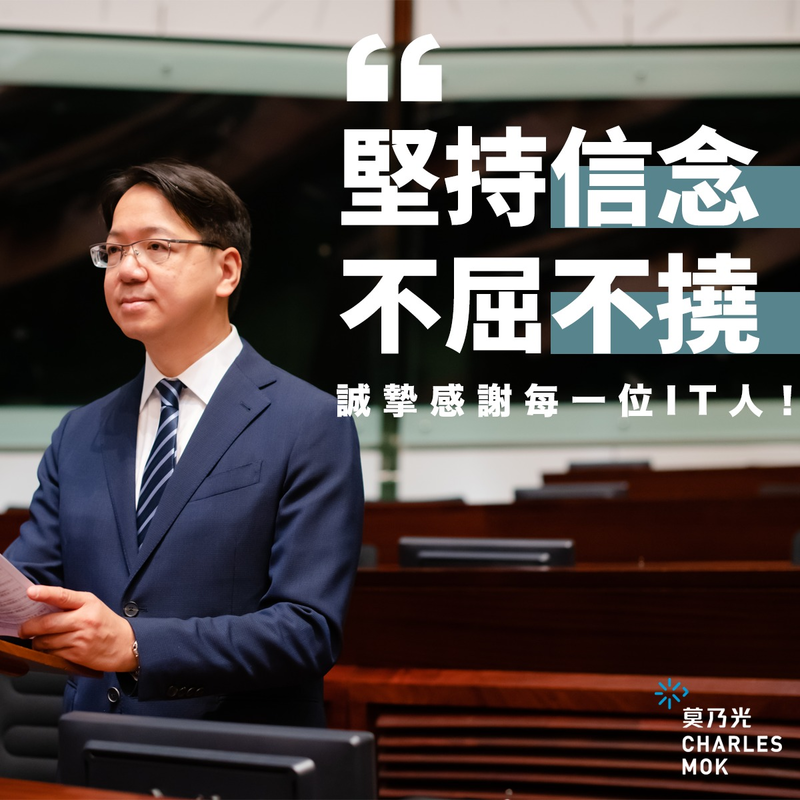 Last Saturday, Agnes Chow was barred from running in the by-election of the Legco seat from the Hong Kong Island district, one that her fellow Demosisto co-founder Nathan Law was elected to represent in September 2016, and disqualified after only nine months in office. The reason for Agnes Chow’s elimination from running in the election was her association with her party, Demosisto, despite the fact that in 2016, Nathan Law was allowed to stand in the election. In fact, several other candidates were also disqualified by their Returning Officers from running in the upcoming by-election because of their political positions. When we asked our Secretary for Justice what kind of legal advice she provided to the Returning Officers that led to their final decisions, the Secretary told us such advice must be kept confidential. When we asked our Chief Executive and the Secretary for Justice who made these decisions, they both said that they were not responsible. Who would believe that these mid-level civil servants can make such sensitive political decision all on their own? And the Returning Officers’ power seems to keep expanding with time. In the past, their job was mostly administrative, mainly to check and make sure the information filled out on the forms were accurate and sufficient to meet the nomination requirements, and that’s it. Now, with the re-interpretation of Article 104 of the Basic Law, the requirement on upholding the Basic Law was expanded from oath-taking to even entering an election, setting the stage for the government to screen out certain candidates at will. As a result, the Returning Officer’s routines have expanded to not only looking at potential candidates’ Facebook postings, listening to their public statements, but also checking their political association, or even guessing their true minds, what they believe in, deep down in their heart. No, I don’t mean that the Returning Officers possess telepathic powers of reading people’s mind. I think most reasonable people would believe that they are just carrying out the political decision made higher up by others. Clearly, barring candidates from standing for election because of their political beliefs is against the International Covenant on Civil and Political Rights, whose application is supposed to be guaranteed in Hong Kong by the Hong Kong Bill of Rights, which in turn is supposed to allow our citizens to stand for election without unreasonable restrictions. This is obviously a clear violation of the rule of law. This is not even a rule by law. It is simply an example of the rule by decree. And this has already damaged Hong Kong’s international reputation. Indeed, Hong Kong’s democratic standing in the world tumbled three places lower in 2017, hitting a five-year low, according to the Economist Intelligence Unit’s 2017 Democracy Index released last week. With an overall score of 6.31 out of 10, the Special Administrative Region is one of fifty-seven “flawed democracies”, with our scores tied alongside the likes of Namibia and Paraguay. Sure, we still rank higher than China, one of the few “authoritarian regimes” in the ranking with zero score for electoral process and pluralism. With China imposing ever tighter restriction on freedom of expression in Kong Kong, and asserting its heavy-handed influence to blatantly interfere with our elections, it is no wonder that Hong Kong is heading the wrong way on the chart, moving down and closer to the bottom of the ranking, where China sits. In the past week, both the European Union and the British government issued statements expressing deep concern towards the ban on certain candidates from the by-election. As Hong Kong’s international reputation as a free and open society keeps getting undermined by such political interference, it would be naive for us to believe that there is no price to pay for Hong Kong’s status as a global financial and business center. And, there are good reasons to worry that things can get worse. The red line of disqualification has moved from only barring those who were said to support independence of Hong Kong to those who may have expressed a leaning toward the so-called “self-determination”. Who can be sure that the line will not move further in coming times, for example, that even those calling for universal suffrage may be deemed inappropriate to run in future elections? Moreover, with the disqualification of Agnes Chau and the demonization of Demosisto, a political party founded by many of the young student leaders coming out of the Umbrella Movement, the authorities in Hong Kong and Beijing are sending a message of disenfranchisement to that whole generation of our youngsters. In response, the democracy camp must first focus on the March 11 by-election, by uniting ourselves and demonstrating to the authorities through the votes of the people what they think about the interference from Beijing, and these disqualifications of candidates. While some people may focus on our internal differences, in fact, I see that our camp has never been so united. From the unity and cooperation we have forged within the Legco, to the recent primary election successfully held for the by-election, in which tens of thousands of Hong Kong citizens lined up to cast their votes, exceeding our highest expectations, we know we must first unite and focus on taking back these four Legco seats in the by-election, and with that we tell the Hong Kong and Beijing authorities, you cannot stop our fight for democracy.